Some time back I'd come across a blue drawstring bag that had some random jewelry pieces. It doesn't appear I'd ever gone through the bag; I found it between my side table and bookshelf this morning while searching for a bobbin that had rolled off my table. 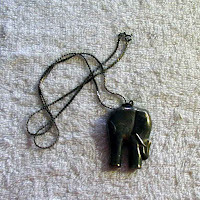 I dumped it out to take a look and came across this tarnished, sad looking elephant on a similarly tarnished chain. The rest of the bag I stuck away in appropriate inventory spots, but him ... well, he kinda called to me. I cleaned him up with some silver polish; he's metal (obviously from the tarnish). I decided on black and silver beads intermixed with silver pieces of chain, and redesigned him into, what I hope, is an appealing piece. Altogether, it's 19" long. 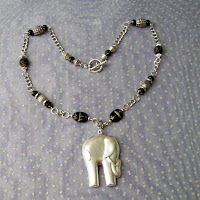 The elephant, the black beads and the chain links are upcycled pieces. I've listed this Elephant Safari piece over in my Artfire shop.